A single-piece foldable cardboard desk designed for school children with no access to basic facilities like a writing surface in schools across underserved communities in India. It is low-cost and can be easily remade any number of times in case of wear and tear. According to a recent survey by Child Relief and You (CRY), an Indian NGO, 75% of primary and upper primary schools lack basic furniture like benches. Children sit on the floor with their backs hunched for long hours. There is no proper surface to place notebooks and write on. Therefore, it leads to problems like bad handwriting, bad posture and poor eyesight among children. Iterations of various forms to identify critical load points and stiffness factors. 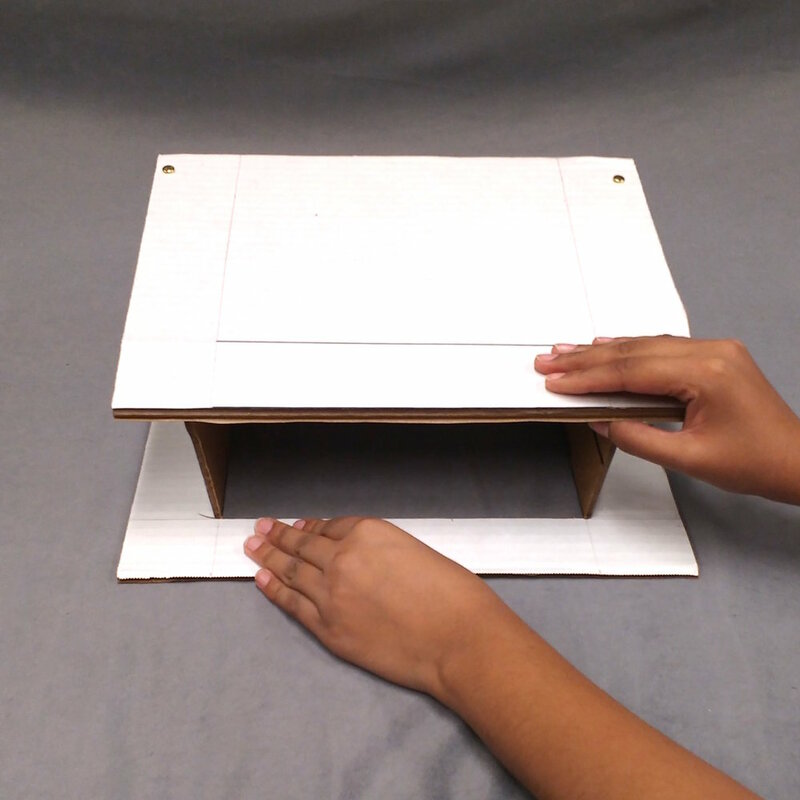 Description: It is a one-piece cardboard that can be folded to form a desk. It has one supporting flap that runs along the longer edge. Comments: The desk is not sturdy. Too much of material wastage due to the cardboard strip bordering the desk. Description: This prototype has four supporting triangular flaps. A triangle is the most stable geometry that uses minimum material. Four triangular flaps run along the four edges of the desk surface. Comments: The top most vertex of the triangular flaps stick above the flat surface making it undesirable to be used as a desk. The surface is flat. A small slope can be introduced. There is a lot of tension in trying to fit all four flaps on to the flat surface. Description: This model incorporates a small slope with two trapezoidal flaps that run along two edges. Comments: It is easy to assemble and is sturdier than prototype two. However, the unsupported edge is a weak link and experiences a dip under heavy load. Description: This model consists of trapezoidal flaps that support the writing surface along three edges. It further has an extra flap that acts as a second folding that goes over the writing surface making it sturdier. Comments: The desk has a small slope. It is sturdier and easy to assemble. Foldesk has a simple 2D geometric template that can be cut and folded to form a 3D sturdy desk. The average life of a Foldesk is 8-10 weeks after which a new one has to be made. It is low cost as it can be made of cardboard. The sizing and the geometry offer stiffness and stability, enabling the cardboard desk to support weights of approximately 4-5 kgs. I ran a test of the product with 4 year old Mikayla. She seemed to understand how to use the product without me having to explain about it to her.